Minns gardeners Addy Smith-Reiman and Pat MacRae warmly invite gardening enthusiasts from across Cornell to spend their Wednesday lunch hours checking out what’s blooming on the Ag Quad. Starting Wednesday, June 23, Addy and Pat bring back a tradition launched in summer 2009 as they host weekly hands-on gardening sessions that feature pruning, weeding, & watering alongside the swapping of gardening tips and trade secrets. Activity venues will span a wide range of garden settings, from deeply shaded corners to sun-drenched roof top garden terraces, lush “hidden” gardens & wishing wells to budding new green spaces planted with principles of sustainable gardening ecosystems at top of mind. Two special tours will take place as part of the series: A tour of select garden sites, hand-picked by tour hosts Addy and Pat on July 7 and an introduction to the Sustainable Sites Initiative (with contributions by horticultural professor Nina Bassuk) on August 4. Weeding Wednesdays will continue through August 11. At the start of each session, participants will meet at 12pm in front of Mann Library. Come dressed in comfortable clothes, bring your garden gloves, and be prepared for an hour of active gardening fun and expertise with gardening masters and kindred spirits. As the days are likely to be warm, ice cream will be provided to keep things cool! For more information, please contact Addy Smith-Reiman (ars25@cornell.edu) or Pat MacRae (pfm25@cornell.edu). 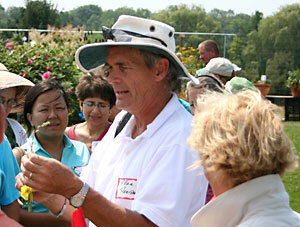 Allan Armitage leads perennial flower walkabout at 2005 Cornell Floriculture Field Day. Dr. Allan Armitage prolific writer, researcher and speaker, will lead the perennial flower walkabout at the Cornell Floriculture Field Day, July 20. At the University of Georgia, Armitage runs the research gardens where he evaluates new plant material from most of the flower breeders in the world. The field day each year attracts floriculture professionals from around New York State and beyond to hear morning presentations from Cornell researchers and industry leaders, followed by an afternoon at Bluegrass Lane Landscape Research Center visiting flower trials, viewing entries in the Kathy Pufahl Memorial Container Contest, and more. Read more about — and register for — the field day. Bluegrass Lane is not open to the public. But there are flower open houses scheduled for the public on Saturday, July 17 and Sunday, July 18, 2010 from 11:00am to 1:00pm. More information. 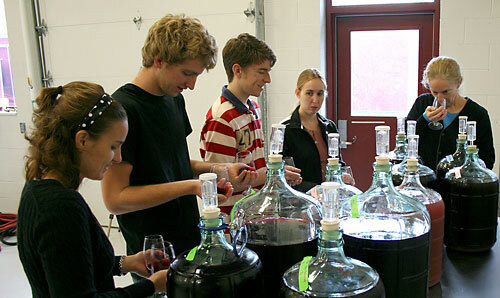 Wine testing at the Viticulture and Enology program's teaching winery at Cornell Orchards. “For the first time, Cornell students have produced wines — big reds and whites — at the Viticulture and Enology program’s new, state-of-the-art million-dollar teaching winery on campus, the only university facility of its kind in the eastern United States. 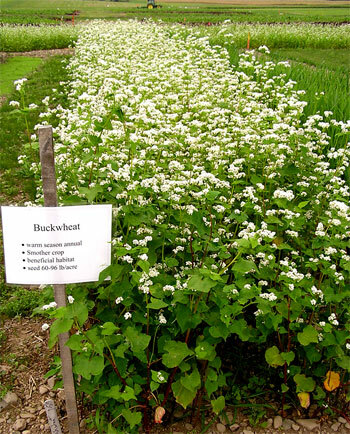 Buckwheat is a warm-season cover crop. Cornell researchers will study the use of cover crops in organic farming and how different organic farming practices affect yields, both with new funding from the U.S. Department of Agriculture Organic Research and Extension Initiative (USDA-OREI). The research will determine appropriate production procedure, seeding and planting dates, and expected benefits to farmers from cover cropping. The researchers also will work with farmers to find the easiest methods for integrating such crops into their production systems. Charles Mohler, a senior research associate in the Department of Crop and Soil Sciences, also received a four-year USDA-OREI grant for $1.4 million to continue two experiments, one for grains and the other for vegetables, that began in 2005 to compare various organic growing strategies. From the Cornell Chronicle, June 2, 2010. Read short profiles about these 2010 Horticulture Ph.D., Masters and MPS graduates, as well as under undergrads in Agricultural Sciences, Plant Sciences, Viticulture and Enology, and Interdisciplinary Studies in ALS. —Nina Bassuk, Department of Horticulture, in a May 26 New York Times article about planting so-called “hell strips” between sidewalks and streets. —Chris Wien, Department of Horticulture, in the May 19 New York Times article Growing Vegetables Upside Down. –Michael Hurwitz, director of of the New York City Greenmarket, on John Ameroso, who retired in March from Cornell Cooperative Extension-NYC after a nearly 35-year career establishing urban food gardens and mini-farms. Read more in the May 18 New York Times article An Urban Farming Pioneer Sows His Own Legacy.